On Thursday, August 25th, the Donald Danforth Plant Science Center Conversations Series on “Let’s Talk About…People, Plants and Partnership: The Mizzou Connection” highlighted the partnership between the University of Missouri and the Danforth Center. The partnership was established in 2014 to hire four joint positions between the two institutions in plant and crop sciences with a goal of increasing existing collaborations. The event featured a question and answer session with Dr. Hank Foley, Interim Chancellor of the University of Missouri and Dr. Blake Meyers, the first faculty member to join MU and the Danforth Center under this initiative. The program can be viewed online at the HEC-TV website. Prior to the event, a reception was held and the IPG was invited to display information on several ongoing research projects. 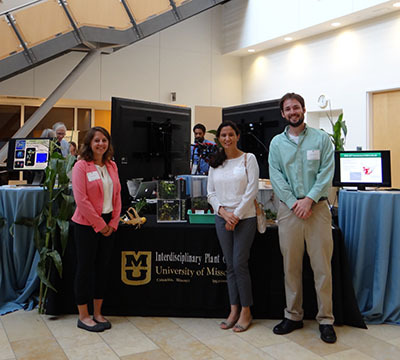 A display on soybean cyst nematodes was featured by Carola de la Tore and Michael Gardner, graduate students in Dr. Melissa Mitchum’s lab. Invisible to the naked eye, plant-parasitic nematodes are a huge threat to agriculture, costing billions in crop losses every year. Farmers worldwide depend on nematode-resistant soybean varieties in order to maintain healthy harvests. Arati Poudel Nepal, a graduate student in Dr. Abe Koo’s lab, presented on Jasmonic acid (JA) for insect defense. She showed both a “normal” and JA deficient tomato plant, and both were allowed to be eaten by caterpillars to show the effect JA has on insect herbivory. Katy Guthrie, a graduate student in Dr. Paula McSteen’s lab, talked about maize evolution (domestication from teosinte), as well as an ongoing collaboration with Dr. Toby Kellogg's lab at the Danforth Center which looks at the differences between maize development and other closely related grass species. Dr. Richard Ferrieri also attended to discuss the plant imaging capabilities at the Missouri Research Reactor (MURR).